1st Drumbanagher Presbyterian Church, Jerrettspass, Co. The pictures include bands like Edgarstown and Pride of the Birches, as well as St Mark’s Silver, all of which are still thriving on-the-march. Indeed, two other bands had local council connotations. 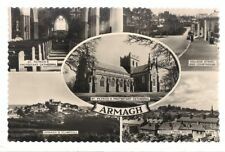 ARMAGH 1957 USED MULTI-VIEW POSTCARD WITH 2 STAMPS PUBLISHED BY GORDON & Co. PUBLISHED BY GORDON & Co. USED AND IN PRETTY GOOD CONDITION - SEE PHOTOS. The Milton Glazette Series. Wear to corners and edges. No overseas sales. ENTRANCE TO TYNAN ABBEY & TYNAN ABBEY, CO. Publisher:- Armagh District Council. The Red line is on the scan, NOT on the actual card. I will do my best to respond as quickly as possible. What you see is what you get. I have estimated the date based on my experience although I may be wrong! The caption on the card says, " St Patrick's Cathedral, Armagh". Vintage Postcard of St.Mark's Parish Church Armagh.c1908-1910.AH7823. E.C. 1902.1936. Pretty good condition apart from the missing stamp. Light crease on back. not visible from front. Publisher:- Armagh District Council. "There is nothing like nostalgia, it's not what it used to be!". 'Add to Basket' (Do NOT use 'Buy it Now'). The caption on the card says, " St Patrick's Well, Co. THE BRIDGE and RIVER BANN, PORTADOWN, CO. Publisher: M & L National Series. Condition: Good to very good. A few marks on front, more on back. Minor corner / edge wear. Letterkenny is a town in County Donegal, in the north of Ireland. Vintage Postcard of St.Mark's Parish Church Portadown Co.Armagh c1908.AH3089. Postcard of St. Patrick's Protestant Cathedral Armagh. Early 20th cent. AH6677. Rare Vintage Postcard of Interior of Protestant Cathedral Armagh. c 1905.AH3087.